Butuan, Philippines: One person died and thousands fled their homes as a tropical storm battered the southern Philippines with strong winds and heavy rains on Monday, officials said. More than 10,000 residents were evacuated as tropical storm Seniang crashed into southern Philippines, affecting 28 provinces in central and southern Philippines, senior officials said. “Tropical storm Seniang made a landfall at Baculin village, Hinatuan town, in Surigao del Sur, at four in the morning of Monday,” governor Johnny Pimentel told Gulf News. “Rains occurred for three days prior to the storm’s landfall. We braved dangerous winds and rainfall to evacuate endangered people,” Pimentel said, adding there had so far been no reported casualties. On Monday, Seniang roared with maximum sustained winds of 65 kilometres per hour near the centre and gusts of up to 80km/h as it entered Hinatuan, the country’s eastern seaboard, from the Pacific Ocean. It continued moving northwest, the Philippine Atmospheric, Geophysical and Astronomical Services Administration (Pagasa) said. Seniang dumped 15 to 30 millimetre of rain per hour over a wide diameter of 300km, Pagasa said, adding that the storm signal number one was raised in 17 areas in central and southern Philippines and storm signal number 2 in 11 areas in central Philippines and southern Philippines. “Bridges and roads were impassable in many parts of Surigao del Sur,” Pimentel said, adding that Storm Seniang reminded residents of Tropical Storm Wushi (Sendong), which initially landed in Hinatuan, then crossed to nearby Iligan and Caragayan de Oro provinces and killed 1,300 people across southern Philippines on December 16, 2011. Flights from Metro Manila to the Caraga region were cancelled. Local airport terminals in Metro Manila’s suburban Pasay City were full of unhappy residents from the Caraga Region, airport authorities said. 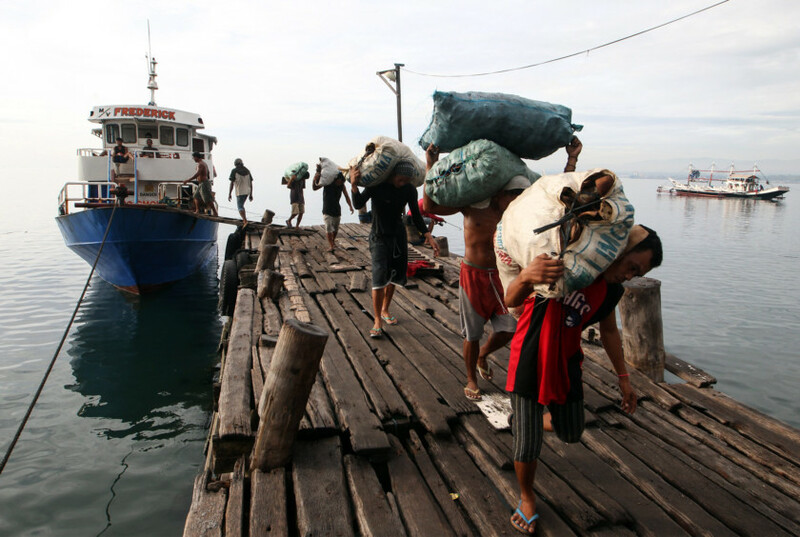 Some 8,696 passengers, 90 vessels, 19 motor boats, and 249 rolling cargo vehicles were stranded due to Seniang, the Philippine Coast Guard said. Storm Seniang was expected to reach Negros Oriental in central Philippines on Tuesday, and Palawan’s Puerto Princesa in northwest Philippines on Wednesday, on New Year’s Eve. It will be a wet New Year in all affected areas since the storm is expected to exit through the South China Sea on Friday, January 2, Pagasa said. Meanwhile, at least 14 people died and eight more were injured due to flooding in southern Thailand, officials confirmed on Monday. Officials at the Department of Disaster Prevention and Mitigation said that while the situation has eased in some areas, persistent flooding continues to affect the three southernmost provinces. Heavy rains and strong winds are expected in the area up until the New Year according to the Thai Meteorological Department. Severe weather warnings were issued Monday for the Gulf of Thailand, with heavy winds and waves expected. The floods have so far affected 1,415 villages causing the closure of 237 schools, 32 religious sites and 17 government offices. Last week, the area was declared a disaster zone by Thai Prime Minister, Prayuth Chan-ocha. 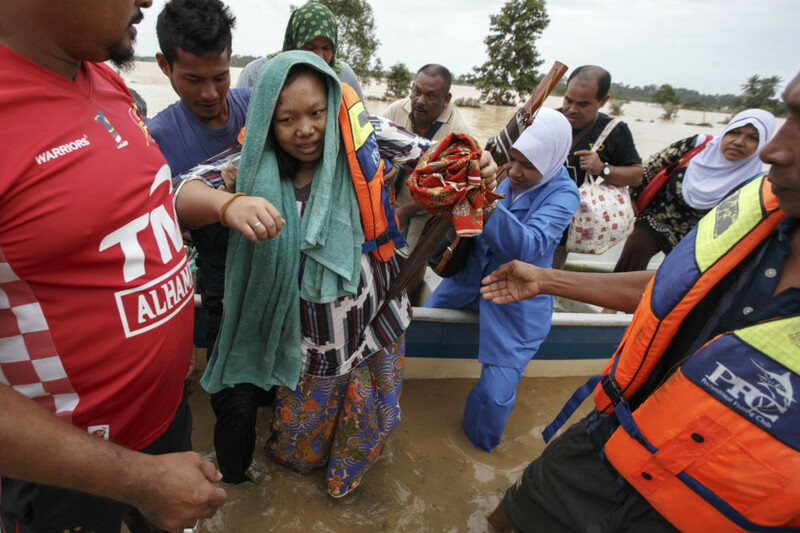 The situation in Malaysia’s Kelantan state continued to remain critical too, particularly in five districts, following the disruption caused by floods. State Flood Disaster Committee chairman Mustapa Mohamed said electricity and water supply in Kuala Krai, Tanah Merah, Rantau Panjang, Pasir Mas and Tumpat, were still disrupted. The Star reported Monday. “Only a third of people in Kelantan have access to electricity while only one-fourth here have clean water,” said Mustapa. 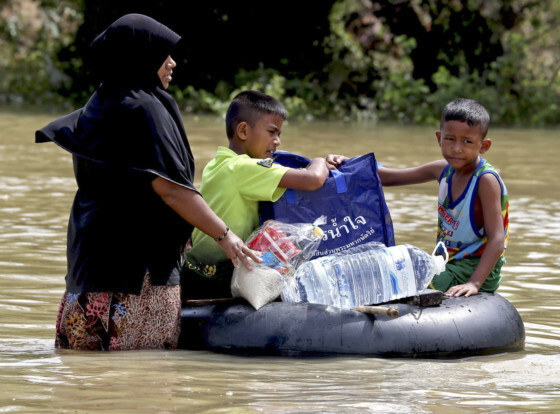 He said although areas like Kota Baru, Pengkalan Chepa and Kubang Kerian were badly affected, authorities could still reach the evacuees there. “We are identifying the number of houses that is completely destroyed. We have identified some 570 houses in Gua Musang. The number will increase,” he added. Authorities have deployed 11 helicopters as well as trucks to send aid. The condition of the states of Terengganu, Pahang, Johor and Perak has also reportedly worsened since the floods hit the country on December 16.